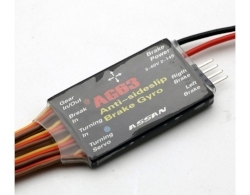 The Assan AG63 is designed for RC Airplane with front steering wheel and electromagnetic brake rear wheel mounted. The gyroscope controls the steering angle of the steering wheel, corrects the airplane off tracking tendency, and accurately responds to the direction of the rocker steering action to improve the airplane problem - easy to turn over when cornering under the high speed. RC Aircraft high-speed running in the open electromagnetic brake, the gyroscope controls the left and right electromagnetic brake strength, so that the aircraft brake does not run away. - Using the intelligent adaptation algorithm,when installing,needs direction automatic adaptation for only one time,no need to adjust during the use. - Skating correction and brake correction effect is excellent, can be widely used in various types of aircraft that require longer distances to take off and land,such as EDF and JET power system RC airplane. - Has control forward steering wheel correction function and control electromagnetic brake rear wheel correction function,according to the actual configuration of the aircraft,these two functions can be used in conjunction,or only use the control forward steering wheel correction function.